The Keepow docks station does not contain a complex design. The idea is simple; snap in both (or just one) of the Keepow docks into the wall mount of a Dyson V10, V8, or V7 and voila, you are now able to store six accessories right next to your Dyson vacuum. Do you have a Dyson V6 or Dyson DC stick vacuum? This is the KEEPOW Dyson dock model you’re looking for. Overall, the Keepow has four slots on each docking station. One of these slots is to be inserted into the Dyson wall mount while the other three can be used to house extra cleaning accessories. This accessory offers an all black color scheme and a basic latch system for inserting and removing the docks from the Dyson wall mounts. Keepow did a great job of designing a docking system that flows with the Dyson wall mounts. These accessory holders are not too bulky and mesh well with the design of the Dyson wall mount. What is the Keepow Dock Made of? The Keepow docks stations seem to be made of a high quality plastic. To test this, we dropped the Keepow docking stations on the ground several times from varying heights to see if they would break. Neither piece broke or appeared to be damaged as a result of the drop tests. The weight distribution of the docks also seems to be well balanced, helping to take pressure away from any specific side of the accessory holster. The Keepow Dyson accessory holder comes in at 7.6″ wide, 6″ tall, and 1.9″ deep (per attached section). Additionally, each docking station weighs 10.4 oz. Is the Keepow Docking Station Easy to Use? Overall, the Keepow is easy to use. That said, it’s not the most user-friendly product we’ve tested. How do you use the Keepow? Using the Keepow is simple. Just snap the right and left docks into their respective slots on the Dyson wall mount. From there, users can add up to six accessories to the Keepow. For starters, not having a button to release the accessories or the Keepow dock itself makes this product a bit more difficult to use. Once you have snapped the Keepow docks into the wall mount, you have to wedge your finger into a small slot and depress a latch to be able to remove the Keepow. Although my fingers are slender, anyone with larger fingers may have more trouble getting the Keepow detached from a Dyson wall mount. RELATED – See how Keepow’s Dyson dock compares to the LANMU Dyson dock. Next up, Keepow’s ability to hold three tools on each docking station wasn’t great. While there are slots for up to three tools per dock,one of these tools on each dock will be hanging upside down. During our tests we experienced difficulty in getting some Dyson tools and attachments to stay locked into the upside down slots. Some tools seemed to lock in fine, however, others were quite loose and would fall out. Is there a way to fix this issue manually? It doesn’t seem like it. I think it really comes down the plastic molding quality on your specific Keepow. Because the tolerances for how tight these tools need to be is so exacting, even being just a little off could make a big difference. In any case, if you find your tools are slipping out of the upside down slots you may try only using lighter Dyson attachments. This will put less pressure on the locking mechanism and more likely keep your tools in place. Is the Keepow Docks Station a Good Value? The Keepow Dyson docks station offers an okay value. The cost is inexpensive, but the overall performance and usability is not the best. Issues with the design and its ability to house accessories properly really hinder the overall value of this product, in my opinion. There are other docking stations similar to the Keepow that do a better job of holding cleaning accessories in place. That said, the Keepow docks do make for a better storage system than having your Dyson accessories stored in a bin, bag, or just on the floor. All in all, Keepow has a great idea on their hands, but it does need some work, in my opinion. Who Should Buy the Keepow Dyson Accessory Holder? The Keepow docking stations are a cool accessory for Dyson V-series vacuums. Most users will find this to be an interesting tool for storage as compared to some other less aesthetically pleasing options. You’re sick of storing your Dyson accessories away from your vacuum – The Keepow docks stations allow users to store up to six cleaning accessories directly with their Dyson V-series vacuum (V7, V8, & V10) by attaching them to the Dyson wall mounts. 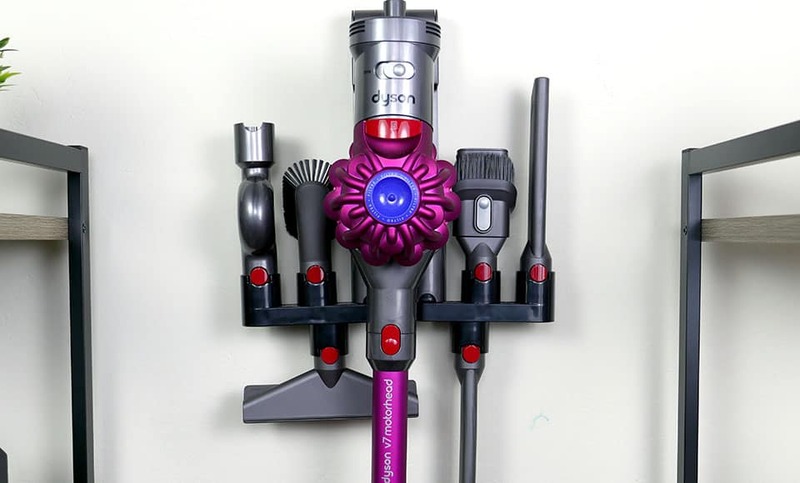 You want to stop searching for your Dyson accessories – By adding this tool to your Dyson wall mount you will be able to quickly pick and swap out your cleaning tool on your Dyson vacuum. Like the idea of less storage space – Keepow removes the need for on-ground storage as the tools can be held by the docking stations attached to the wall mount. Overall, this is a much cleaner look. For more information on the Keepow Dyson accessory holding docks see here. Why did the Keepow score the way it did? Design – The general design concept is good, however, the lack of a true release button isn’t great. Also, the slot to release the tool is fairly small. Performance – The upside down slots don’t seem to lock in and hold as firmly as they should (during our tests some attachments fell out). The small tool release slot isn’t ideal either. Quality – The quality of the plastic seems fine, but Keepow loses points for the molding quality (which if more exact, would likely have not resulted in tools falling out). Usability – It’s a simple and easy tool to use. Not much to complain about. Value – Definitely has its flaws, but it’s also inexpensive. The Keepow docks station is designed to easily store your Dyson stick vacuum accessories. The dock station works with the Dyson V7, V8, and V10. Each of these vacuums includes a wall mount, which Keepow clips into. The accessory station allows you to hold up to 6 accessories on the wall mount. The Keepow docking station is a nice extra to help better organize and access your Dyson tools and attachments.